Ann Laura Stoler wants readers to push beyond established concepts about colonialism and its enduring effects. In her ninth book, Duress: Imperial Durabilities in Our Times (Duke), Stoler asks “what sorts of rethinking and reformulations” might allow a better understanding of “colonial presence.” Her ambition is not to overthrow the concepts that underlie knowledge about colonialism. Rather, she uses methodical interventions to “inhabit them differently,” broadening our sense of the complex outcomes of imperial projects. To work at the edges of a disciplinary boundary, or in the borderlands between disciplines, means that a scholar often occupies a liminal space, opening oneself to the possibility of being equally misunderstood by peers in multiple fields. In a recent interview with Itinerario, Stoler explains that such misunderstandings have sometimes determined the reception of her work, especially in the early part of her career. “When I was in Madison,” Stoler says, “a stolid World Bank consultant on the faculty criticized my work for being 'political' and not 'scholarly' and with avuncular largesse counseled me to cease the former if I wanted tenure.” But Stoler persisted in her provocative line of research, drawing on Foucault and Marx, and navigating between anthropology, history, and philosophy. Her work is now recognized precisely for its deft integration of multiple disciplinary perspectives, and has a well-established home at the New School for Social Research. 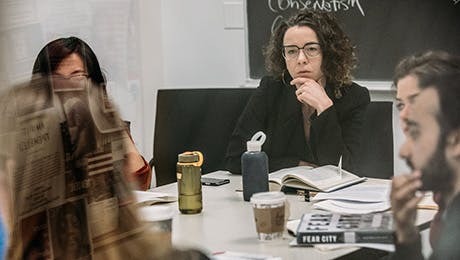 Ultimately, the convergence of Stoler's passion for critically grounded, non-traditional research and the New School's commitment to its history of critical scholarship resulted in the creation of the Institute for Critical Social Inquiry. Today, Stoler's Institute for Critical Social Inquiry offers weeklong immersive experiences for young and seasoned scholars from around the world, and is comprised of graduate school-style master classes each morning and project workshops in the afternoon. Every institute puts advanced graduate students and junior and senior scholars into an intensive intellectual environment in which appreciation of the politics of knowledge is key as they cultivate and refine their critical skills, and share work with their peers. Applications for the 2017 Summer Seminars are open through December 15. International Scholars, especially those based in the Global South, are encouraged to apply. Scholarships and travel grants are available. This summer's featured lecturers will be Anthony Appiah, David Harvey and Michael Taussig. In previous years the ICSI lecturers included Judith Butler, Gayatri Spivak, Talal Asad, Patricia Williams and the New School's Simon Critchley and Jay Bernstein. The New School's focus on heterodox perspectives, along with its emphasis on the connection between theory and contemporary political and social issues, continues to attract faculty and students eager for the opportunity to work across disciplinary boundaries, for being unsettled, and for mixing and matching lines of intellectual influence. For the rest of Ann Stoler's interview, read the upcoming issue of the Leiden-based journal Itinerario. Ann Laura Stoler is Willy Brandt Distinguished University Professor of Anthropology and Historical Studies at The New School for Social Research. Stoler is the director of the Institute for Critical Social Inquiry. She taught at the University of Michigan from 1989-2003 and has been at the New School for Social Research since 2004, where she was the founding chair of its revitalized Anthropology Department. She has worked for some thirty years on the politics of knowledge, colonial governance, racial epistemologies, the sexual politics of empire, and ethnography of the archives. She has been a visiting professor at the École des Hautes Études, the École Normale Supérieure and Paris 8, Cornell University's School of Criticism and Theory, Birzeit University in Ramallah, the Johannesburg Workshop in Theory and Criticism, Irvine's School of Arts and Literature, and the Bard Prison Initiative. She is the recipient of NEH, Guggenheim, NSF, SSRC, and Fulbright awards, among others. Recent interviews with her are available at Savage Minds, Le Monde, and Public Culture, as well as Pacifica Radio and here. For more details about Ann Stoler's publications, see a small selection from the NSSR Bookshelf.